A hectic scene in downtown Silver Spring this morning. A man attempted to rob the BB&T bank on Wayne Avenue. He said he had a bomb and demanded 20-thousand dollars. He never got the money. The bank’s manager hit a panic button to alert police. Police later encountered the man in an alley near the Silver metro station where a Montgomery County policeman shot and killed the suspect. Police determined there was no bomb in the man’s backpack, but an item made to look like a bomb. Residents in Prince George’s County will have a chance to tell two of its top state representatives what they think of the government shutdown. The Prince George’s Chamber of Commerce will host a discussion on the shutdown Thursday morning with Maryland U.S. 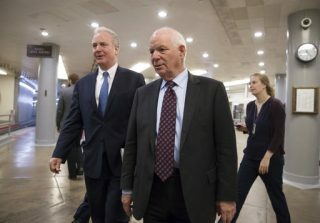 Senators Chris Van Hollen and Ben Cardin. The event will be held from 8:30-10:30 am at the Double Tree Hotel , 9100 Basil Court in Largo. The public is invited, but seating availability is on a first come first serve basis. The Washington Post is warning people about fake copies of their newspapers. The Post said phony print editions are circulating around town, as well as a a website designed to look just like the paper. People were seen outside the White House and Union Station handing out the fake copies, which falsely read that President Trump was leaving office. Another front page headline read, “Celebrations break out worldwide as Trump era ends.” The Post says it is looking into the issue.